Raith Rovers have parted company with manager John Hughes after suffering relegation from the Championship. Hughes exit was confirmed, along with assistant Kevin McBride, following the penalty shoot-out defeat to Brechin City in this afternoon's play-off second leg at Stark's Park. Rovers were expected to progress after the 1-1 draw at Glebe Park in the first leg, however, the visiting part-timers, who finished fourth in League One, claimed a momentous win after matching the home side goal for goal in a dramatic 3-3 draw over 120 minutes. And a dark day for the Kirkcaldy club was confirmed in the penalty shoot-out as Brechin goalkeeper Graeme Smith saved three times to condemn Rovers to the drop, and send City through to a play-off final with Alloa. The financial consequences of relegation are expected to be far reaching at Stark's Park with job losses likely, both on the playing front and in the backroom staff. Keeping the club afloat will be the number one concern. There may even be the prospect of part-time football. That realisation was evident on the faces of the Raith players after the game, with a number in tears as they exited the stadium following brief discussions with the board. A full meeting is scheduled for Tuesday. Hughes made one change from the side that started the first leg with Ryan Hardie replacing Rudi Skacel in the starting line-up. If the manager hoped this would make his side more dangerous from open play than they were in the first leg then it proved misguided as a frustrating first half ended goalless. Raith's lack of width in a narrow 4-2-2-2 system, and the lacklustre tempo of their passing, played straight into Brechin's hands, who were rarely stretched as they defended their 18-yard box with steely determination, and looked to hit on the break. Nerves also played a part - after all Raith had more to lose than Brechin - and it was evident as players struggled with the basics in the opening exchanges. A well-drilled Brechin defence were not properly tested until the 30 minute mark as Hardie chased a lost cause to force Smith into a spill, and Jonny Court latched onto the loose ball but couldn't fire it past the 'keeper on the ground. That sparked a better spell of pressure from Raith as half-time approached as they finally started to shake off the early anxiety. On 39 minutes, Court had his back to goal but should have done better than blaze over the bar from a Craig Barr knockdown. Declan McManus drew another decent save from Smith with a low drive from 20 yards, before Danny Handling found space in the box to force another low stop from the Brechin 'keeper as half-time approached. Raith were controlling the game without being dominant and they were punished for a horrendous error six minutes after half-time. Defender Jean-Yves M'voto played a risky pass back to 'keeper Connor Brennan without looking allowing striker Ross Caldwell to intercept and roll it past the Northern Irish stopper from close range. Raith were now toiling with no-one providing inspiration on the pitch - and none coming from the dugout. Hughes finally changed things but played all his cards at once in the 63rd minute in a triple substitution as Bobby Barr, Jordan Thompson and Scott Robertson, making his first appearance of the season, took the place of Court, Kyle Benedictus and Ross Matthews. The changes did not go down well with the home support, who loudly booed the withdrawal of Matthews, and little wonder as he'd been one of Raith's busiest players in midfield, but just four minutes later the equaliser arrived. M'voto made up for his earlier error as he powered home a header from McManus free-kick, and Raith were now expected to kick on. Instead, they allowed Brechin to retake the lead with just seven minutes left as M'voto was again caught out, this time by a high punt up the park, which he completely misjudged as it bounced through to sub Alan Trouten to fire past Brennan. The big Frenchman may have cleaned up at the player of the year awards, but for all his many dominant performances, he's made too many mistakes in key games, and these ones were the most costly of all. Raith were now staring League One in the face, but incredibly, they got themselves out of jail with an injury-time equaliser to force extra-time. Barr's cross fell to Hardie who forced Smith into a save at his near post, but the rebound broke to McManus who rifled home to the immense relief to everyone in the home crowd, no more so than those in the directors box. With the tiring part-timers forced into an extra half hour, surely Raith would see the job through now? So it seemed on 112 minutes when Iain Davidson's pass split the Brechin defence for Hardie to race through and finish with his usual aplomb, rounding Smith to stroke home. But in a season where Raith have made things harder than they needed to be at every possible opportunity, they failed to put the game to bed and Liam Watt crashed home a stunning 25-yard free-kick with six minutes left to force the game to penalties. Raith lost the toss which meant the spot kicks were taken in front of the McDermind Stand housing 200 Brechin fans, and 2800 empty seats. After five penalties each, the teams could not be separated with two conversions and three misses each, so it came down to sudden death. 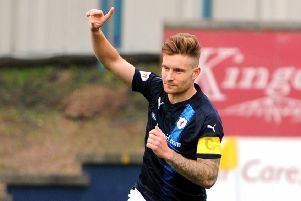 Robertson took Raith's sixth, a surprise given his lack of recent action, and a poor effort was easily saved by Smith. Andy Jackson stepped up and sent Brennan the wrong way to spark jubilation among the Brechin fans, and utter dejection in the home end. For Raith, the post-mortem must now begin into a season of catastrophes. There will be scapegoats, but there isn't a director, coach or player who can shrug off the responsibility of this shambolic campaign, other than Craig Easton and his development squad, the one positive the club must cling onto. From promotion play-offs to relegation in 12 months. It should never have come to this. Raith Rovers: Brennan, Thomson, Benedictus (Thompson 63), M'voto, C.Barr, Matthews (Robertson 63), Davidson, McManus, Handling, Court (B.Barr 63), Hardie. Brechin City: Smith, McLean, Dyer, Fusco, Lynas, Dale, Ford (S.O'Neil 75), Graham (Love 98), Jackson, Caldwell (Trouten 75), Watt. Not used: Dods, Costello, P.O'Neil.